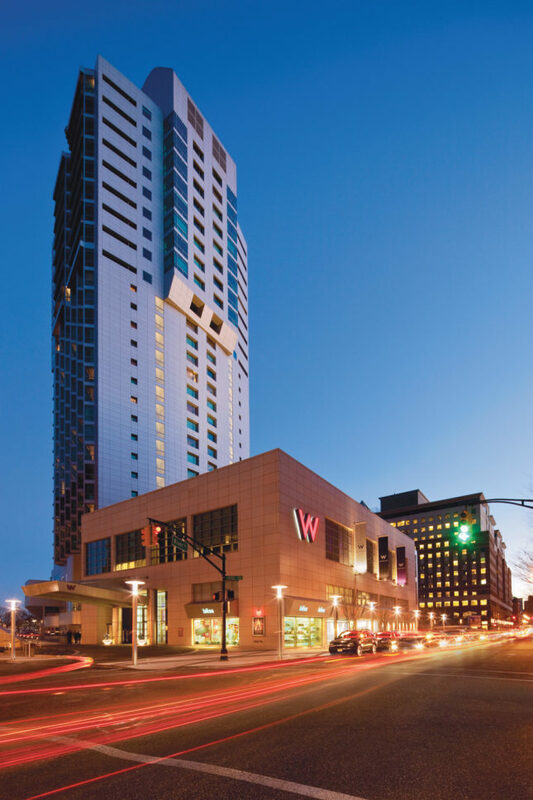 David Barry has made a name for himself developing mixed-use projects in retail and hospitality, including The Standard, East Village and the W Hoboken. 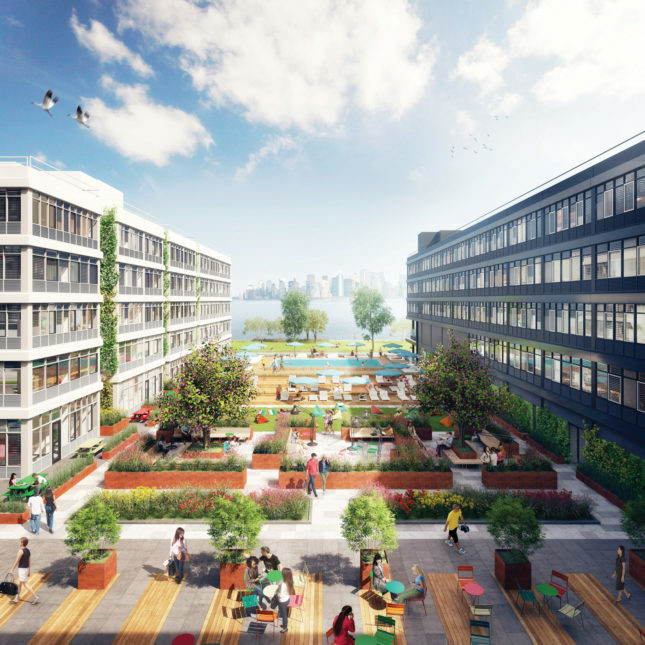 His new residential project, Urby Staten Island, is on the market on the borough’s North Shore, with 900 units and a mix of retail, including a coffee shop, a bodega, and a communal kitchen—all supplied by an on-site farm. AN’s senior editor Matt Shaw sat down with Barry to discuss his experience in developing hospitality and retail, and how that is informing his approach to Urby and the neighborhoods around it. 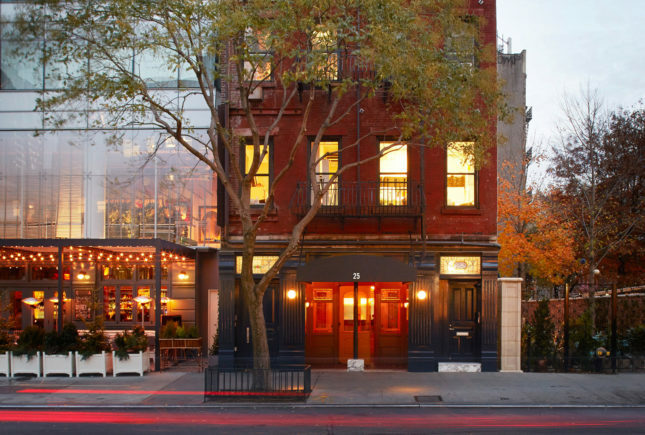 The Architect’s Newspaper: At Urby, you focus on public space. Is this something you have been thinking about throughout your hospitality work, or is it new to this project? David Barry: It’s been a little bit of an evolution that we’ve crystalized in this project. I’ve done a lot of apartments over the years in these outer-borough locations. 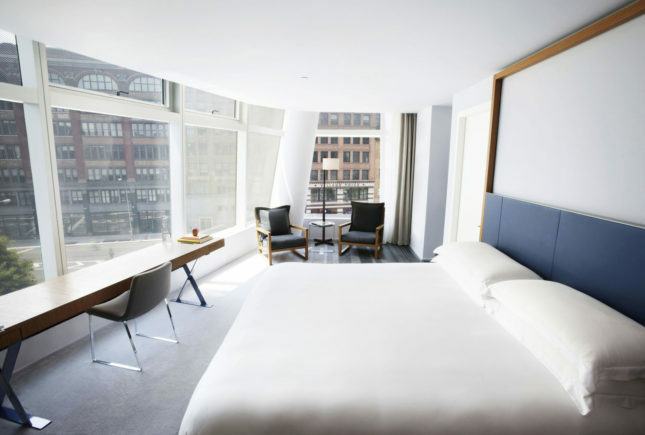 More recently, I have been doing hotels—what is called, roughly, “lifestyle” hotels or what used to be called “boutique” hotels. There has been an evolution in real estate as people move to urban areas but are on the move and cyber-connected all the time. I think this has given rise to a desire for urban residents to connect more to their spaces, to connect to each other more, and to move in the direction of a community. When you’re programming those spaces, the end goal is really just to create a product that people connect with better and to provide a better experience. We can put in a screening room and just let it exist, but in my experience, I’ve learned that there was an opportunity to take another step further and get people to connect to your product in a way that creates an emotional connection in a way that the big brands weren’t doing until recently. That’s what we’re striving to do with Urby. Does this connection come through the retail and the shared spaces in Urby? Yeah, I think the retail is really more about place-making and that has been around for a while: I look at Andrés Duany and Elizabeth Plater-Zyberk at Seaside, Florida, or any of that kind of stuff. We need to get life on the streets; we need to get retail mixed in and incorporate mixed-use development. What’s a little more unique about Urby is that we are not just leasing curated retail out to third parties and creating a place, but we are taking those public spaces and being more thoughtful about how to make them an everyday piece of people’s lives. So instead of having amenities that you might use once in a blue moon, we tried to be really, really thoughtful about what is going to enhance somebody’s experience on a daily basis. 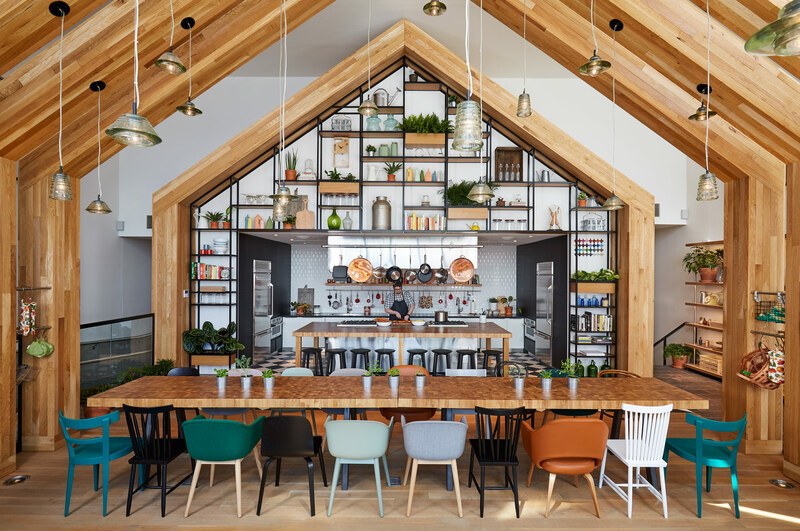 We want to ensure that our commitment to programming is going a little bit beyond with things like the urban garden or the communal kitchen or the coffee shop that is embedded into the lobby. It is about connecting people around food and wellness in a sense. I think that because Staten Island is a little bit more of a green, spacious borough, and we had a pretty substantial roof area, we thought that a roof garden could engage residents. We have a farmer-in-residence who helps residents participate—the fruits of that labor are eaten by anybody in the cafe or in the kitchen. How are you thinking about retail at Urby? In this instance, we’re spending a lot of time being very particular and choosy about who we want to go into that space. Because the retail is about place-making, there’s an equation where you can’t necessarily squeeze every single dollar of rent out of it if you want this place to be made in a unique and a different way. 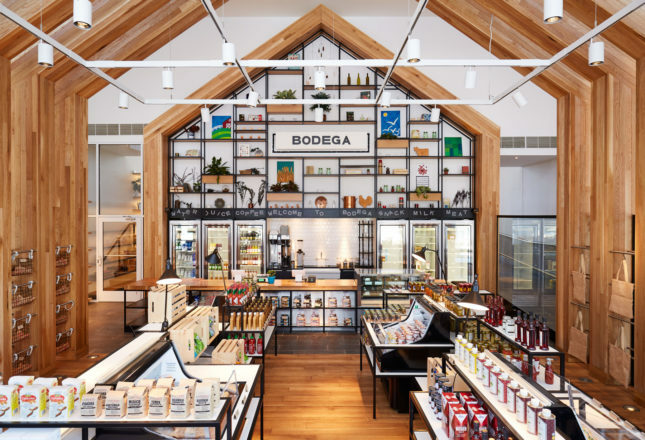 That’s what we’re striving for—to create a place that’s authentic and that hosts regional retailers and restaurateurs, whether they’re from Staten Island, Brooklyn, New York, or New Jersey. It’s not a mall concept where we’re preleasing to national credit. We’ve learned to recognize that upfront and to pay a lot of attention to how you choose the retailers and how you support them. The architecture of the buildings and the pedestrian experience are very important. There are thousands of decisions and some of them have bearing on the neighborhood in general, while others just have bearing on residents or particular constituencies within the building. We tried to pay attention to the architecture and how the building fits into the community, particularly with respect to pedestrians. 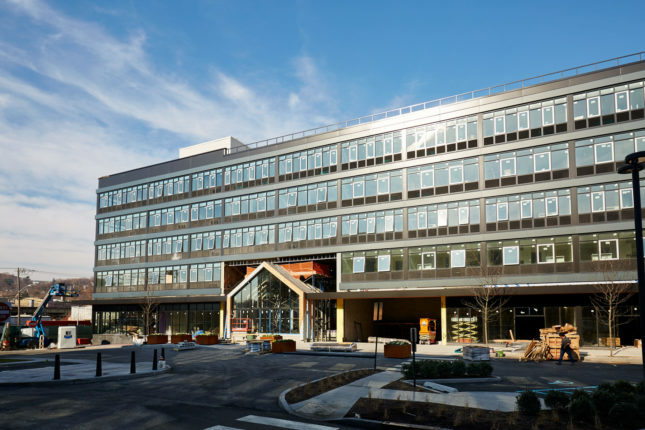 I think we’ve been really thoughtful about both of those considerations in this project: How pedestrians experience the building and the development in terms of the sidewalks and the landscaping and the street width, etc. What role does design play in all of this? Design has played a huge role in this project. We specifically went to Europe to find a non-American architect for this property. Not because I discriminate against Americans, but because we’re trying to think about using space differently and have a different viewpoint on creating smaller urban social spaces and public spaces. The way the Europeans think about space with their city centers that have been so tight and so constrained with a lot of people next to each other for so long, you know. I think it was really interesting to bring in creative firm Concrete from Amsterdam. It feels very different than anything else you’ve experienced, at least in the residential sphere, and a big part of that is the European sensibility and this European eye and creating spaces that encourage people to mingle or connect. It’s interesting to bring that into the New York area because it is becoming a world city. We’re all more cosmopolitan, we travel a lot, and it’s neat to take things from different societies. I think one thing Europe has that’s great is the piazza, right? That whole street culture and plaza culture is some of the best in the world, you know, in terms of how Europeans use their indoor-outdoor space and connect with each other. It’s been really interesting to work with Concrete and bring that over here to experiment with it. How do you think this retail environment and improvements will radiate out from Urby? Where we’re located in Stapleton is really the historic part of Staten Island, and so it got disinvestment and kind of went off people’s radar. I hear a lot of stories from people saying things like, “Oh my God! Bay Street! When I was a kid, we used to go there, and my father used to take me to a restaurant and we would go out after.” That is what I think Urby is. I think it’s like a reason to check out the North Shore of Staten Island. It’s going to have a really great impact on Bay Street. I think there are some really neat things about the scale and the architecture of that street and the little park there, Tappen Park. I think what it really needs is some attention and some notoriety, and I think that once people have a reason to come to that neighborhood, it will get some. Typically,it’s done often with artists who go to places like Williamsburg and Bushwick and then, before you know it, they’re having some little pop-up things or some art shows or their friends are opening a cafe or whatever it is, and that is getting people talking about it. Staten Island had been a story of kind of suburbanization. Why? Because the Verrazano Bridge opened in ’62 and, boom, the floodgates turned on in Staten Island, and that was a period of time when the world was kind of deurbanizing. So it developed in a bit of a peculiar way, because the people that inhabited the South Shore and those new developments on the mid-island and South Shore had kind of written Bay Street off. Why did you feel this site was appropriate for this kind of strategy? Well, part of the strategy with this is that it’s just getting so prohibitively expensive to live in Manhattan or in the well-trafficked Class A locations. Part of the attraction of this location was that it’s formerly industrial and the neighborhood needs some revitalization. It has great mass-transit links, particularly for Staten Island, in that it’s got a subway stop that goes directly to the ferry and it’s on the waterfront. It connects into Bay Street, which is historically a street with a lot of retail, a lot of restaurants. During most of my career, a lot of the story for the outer boroughs has been the redevelopment of these formerly industrial places in Williamsburg, Bushwick, Long Island City, Staten Island, South Bronx, Jersey City, right? So I really saw this North Shore waterfront as a continuation of that movement of expansion to the outer boroughs where housing is more reasonably priced. This was a great opportunity to start with mass transportation and riverfront access in a borough that has not had a lot of creative investment or development in the last 20 or 30 years. The elected officials, the community leaders, and the regular old residents seem to be very excited. The EDC [Economic Development Corporation] just opened the park that’s in front of Urby, and the city is really working hard through various departments like EDC to also attract attention to this neighborhood, and I think it’s one that needs investment and has a lot of potential, and the same thing with the elected officials in terms of, you know, of Staten Island because I think that most people recognize that for a society, for a city, for a community to thrive and to move into the future, there needs to be investment of some sort into that community. They’re incentivized and they’re excited and they’re being helpful about getting more private investment attracted to that area.